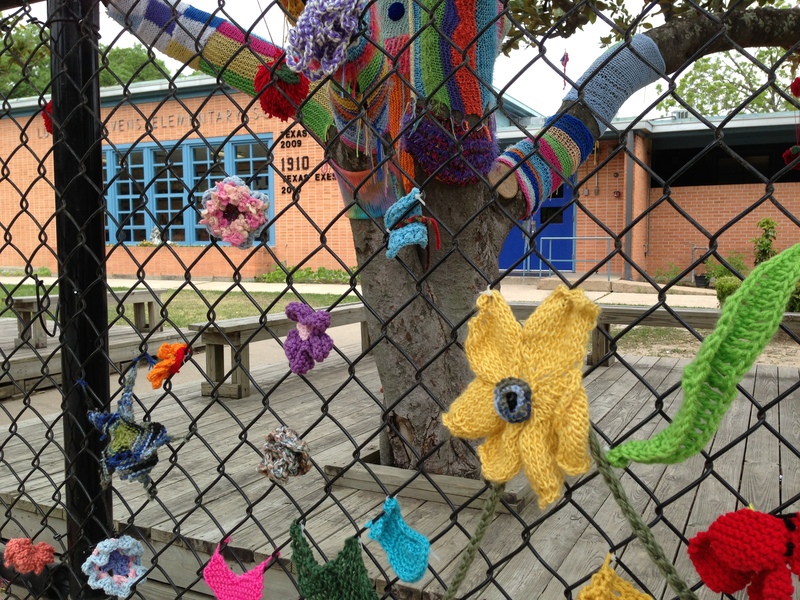 To my surprise, there has been a yarn bombing not far from where I work! 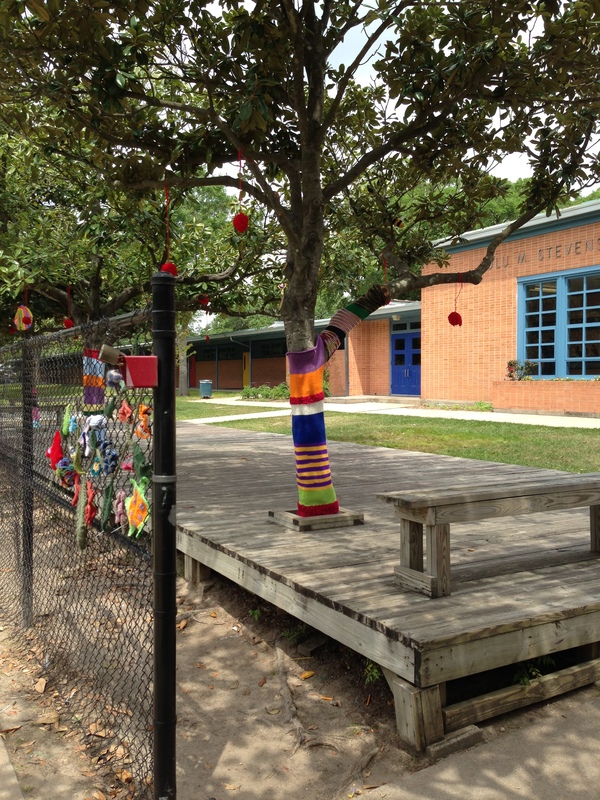 Last Friday, I cut down LaMonte on my lunch break to check out an estate sale, and I as I passed Stevens Elementary School, I noticed the yarn bombing. I screamed out loud as I drove past, “Oh wow! 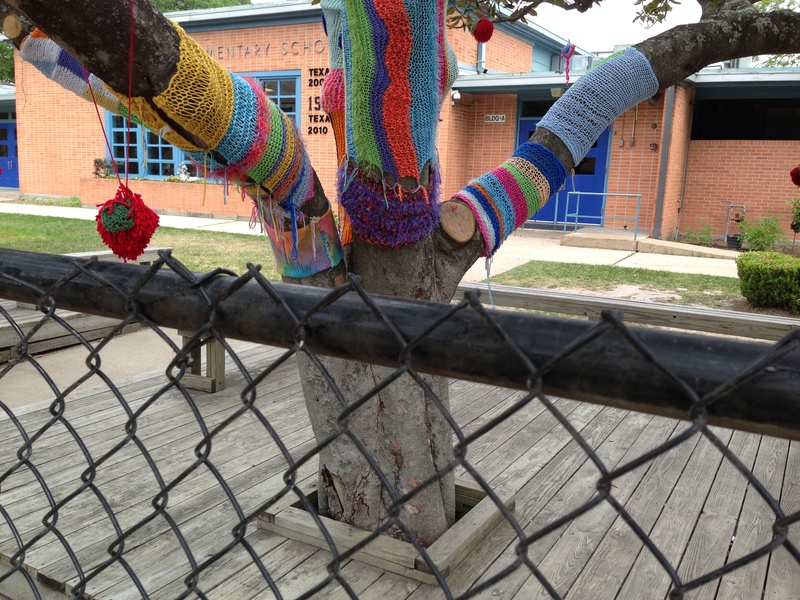 A yarn bombing!!!”. Of course, I had to pull over and take a few pictures! 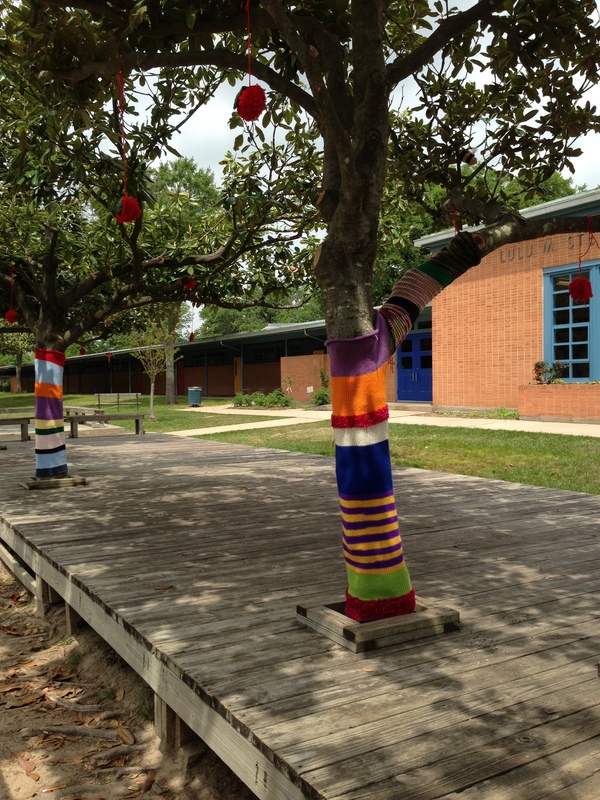 Several trees were wrapped in colorful knitted pieces and bright red, yarn apples were hung from the trees. 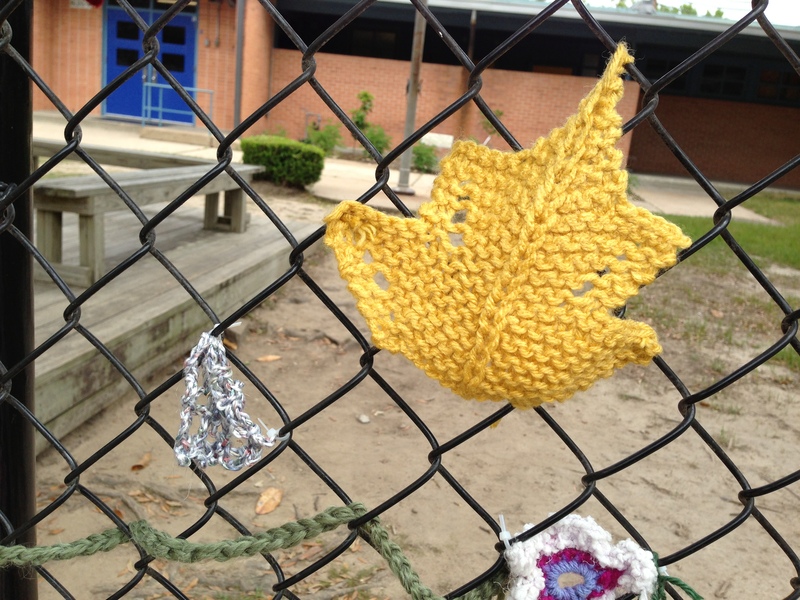 Knitted and crocheted flowers and leaves adorned the chain link fence. It was so beautiful and it really gave some color and pizzaz to the school. Upon telling my mother what I had seen, she told me she saw a news clip about this on one of the local tv channels. 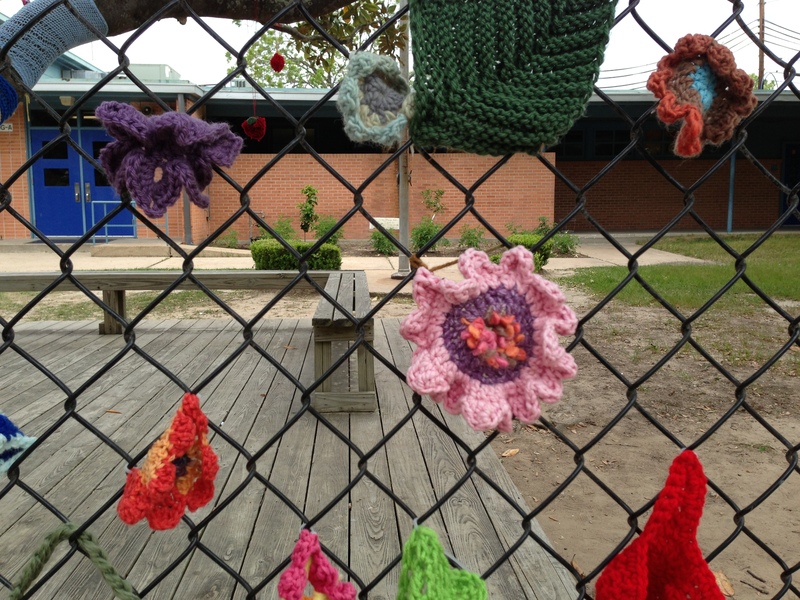 I did a search for the video and found out that the members of the Oak Forest Yarn Club did all the knitting and crocheting. 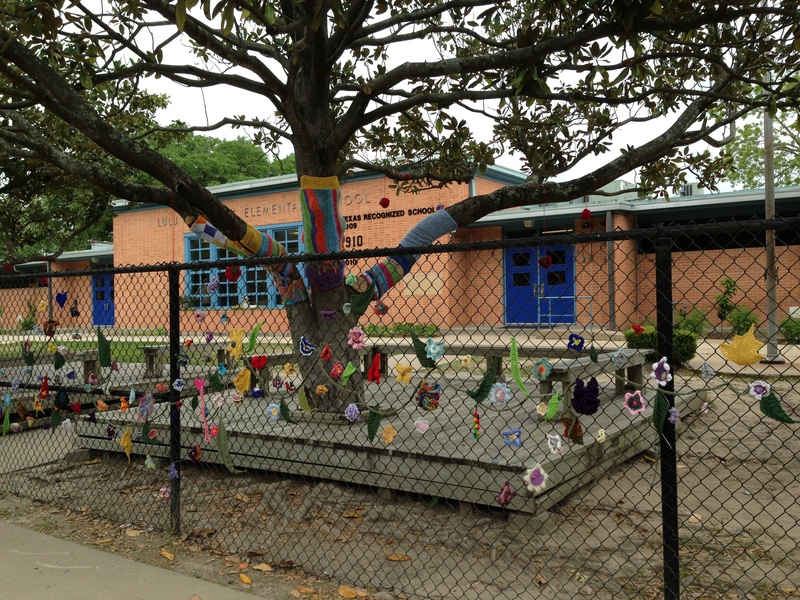 They had the school all decorated for the kids when they returned from Spring Break a few weeks ago. What a wonderful surprise for those children! 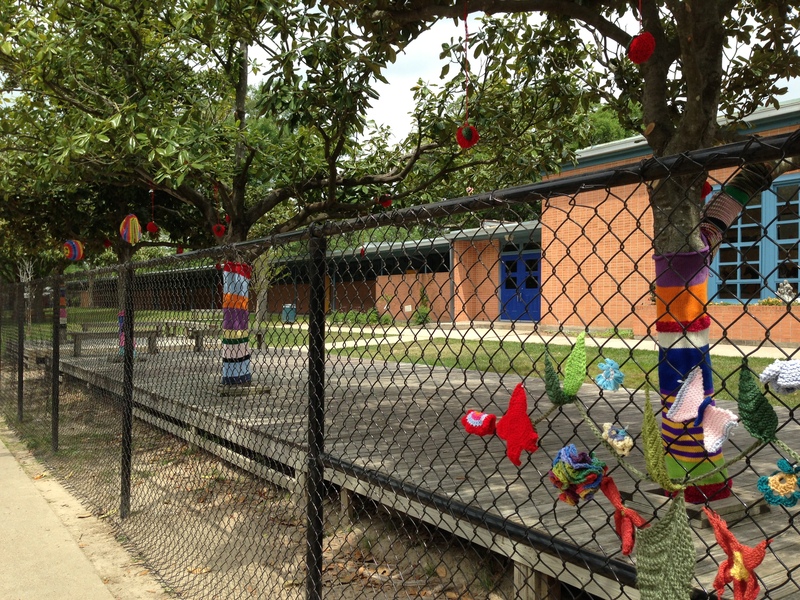 The yarn bombing is supposed to be kept up all spring, so if you live in Houston, you might want to go check it out. 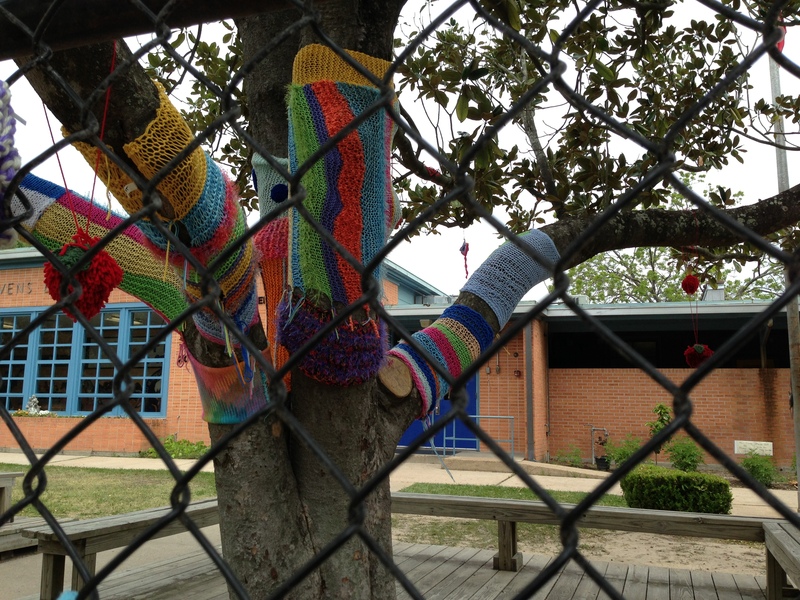 If you don’t then you can enjoy the knitted art below via the pictures. Enjoy! I’ve been putting off blocking some of my garments because I felt they would look better if lace blockers were used in the process. Every time I placed an order for yarn, I would consider ordering some, but at $20 a set, I just couldn’t bring my self to place the order. I always thing to myself, “$20! I’d rather spend that money on more yarn!”. 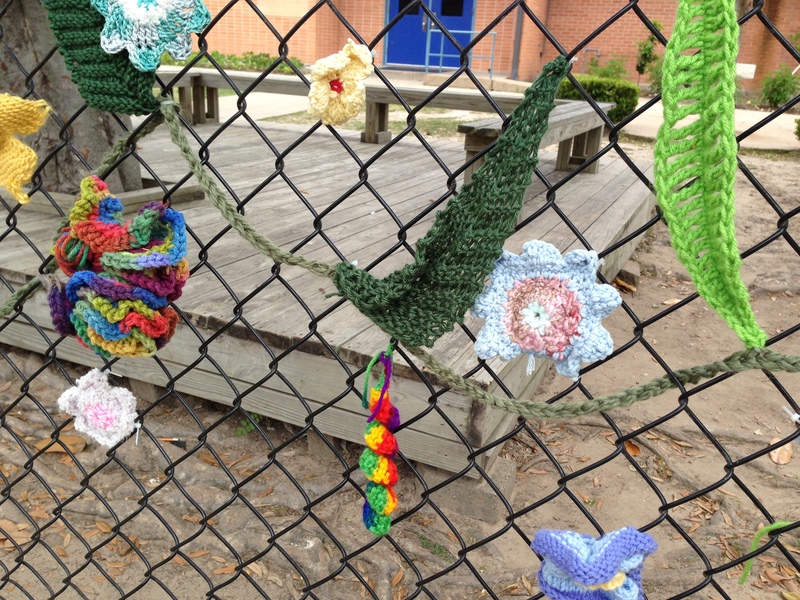 So I did an internet search and it seems that some people block using yarn. Who knew? So I thought I’d give it a try too. Much to my surprise, it was pretty simple. So here is a tutorial on how I blocked one of my wraps without lace blockers. Before blocking, find a place in your home that is large enough to accommodate the size of piece you are blocking. Also make sure it can be left out for a day or two while it dries. I prefer to block on a spare bed or carpeted floor, laying my blocking mats out on top. 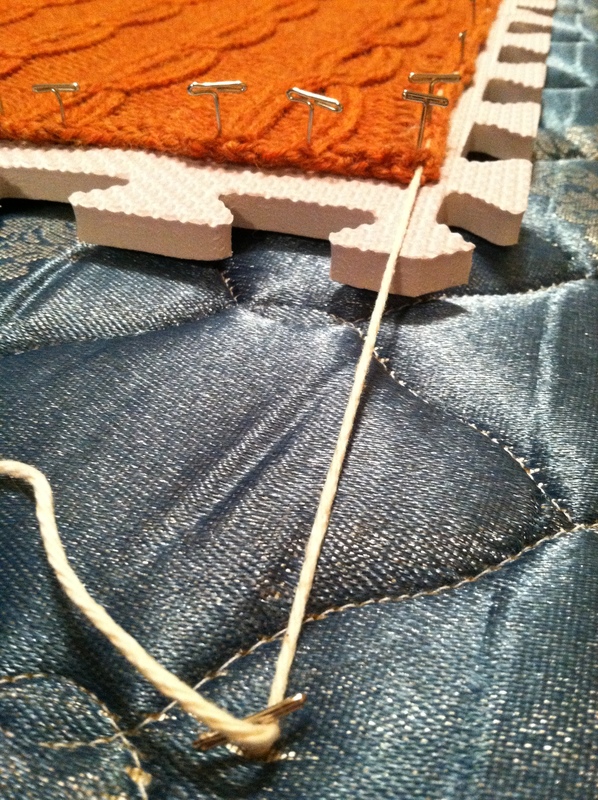 Step One: Using scrap worsted cotton yarn, thread a tapestry needle. Be sure to use cotton, because it will not stretch like other yarns when wet. 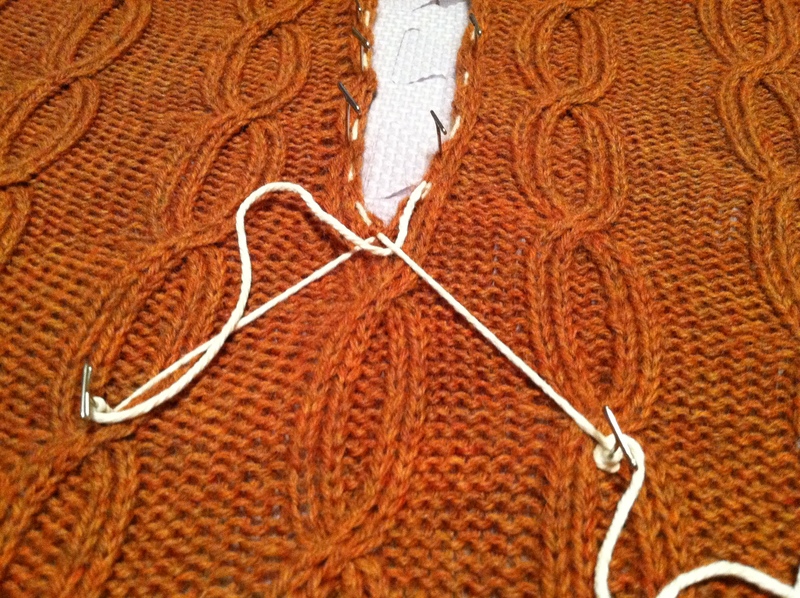 Weave the needle along the straight edge of your knitting. I usually weave between the second and third stitch from the edge. Once you’ve weaved the yarn all the way across, flatten out your edge, so you don’t have any bunched up edges. Allow 10-15 inches, to be sticking out on each end. Cut yarn. Repeat this process until you have all the edges weaved. Step Two: Soaking. In a clean sink, run cold water. Add Soak (or your favorite woolwash) to the cold water. Stir it in with your hands and place the garment in the sink. Allow your garment to soak about five minutes in the cool water. Remove garment from sink and lightly press with hands to remove water, but do not wring or twist garment. Lay wet piece on a large bath towel and roll the towel up (with garment) to absorb excess water. Step Three: Lay damp garment onto the blocking mat and block to the dimensions given in your knitting pattern. 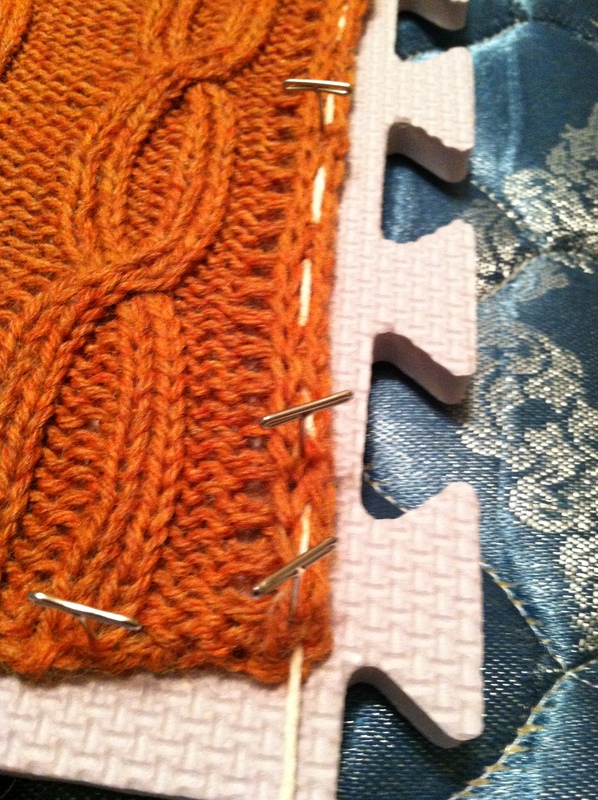 Place the T pins to the inside of the blocking yarn. See picture below. 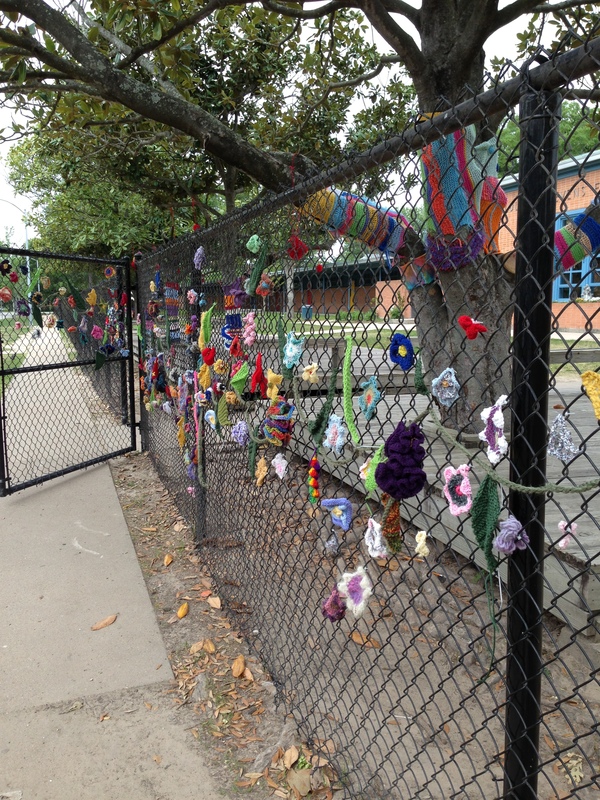 You will need to anchor the tails of your blocking yarn. To do this, wrap the end of your tail around a T pin and stretch it away from the garment and anchor into the mattress, carpet or blocking mat. See picture below. Step Four: Once your garment is pinned and it looks all nice and straight, it’s time to be patient and let your garment dry. Step Five: Enjoy wearing your blocked, finished project!